There are rumors going around the world (literally), that I am retiring. Instead, I am adding a number of VMC-Certified DCFacilitation trainers into the international recreational drumming community. With the help of Jim Boneau, Mary Tolena and many of my students who have evolved into my teachers, this is a plan that has been in the works for many years. 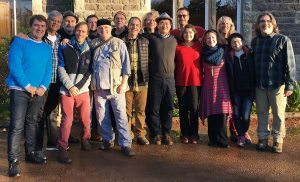 The first Village Music Circle “Train-The-Trainer” Program (TTT) started right after the 2017 Scotland Playshop ended. I met 16 of my international protégés there at the Wiston Lodge. Jim Boneau and I trained them to teach their own 3-day drum circle facilitator Playshops, that I have been doing in each of their countries for the last 20 years. I will continue to do the 6-day programs around the world, when and where appropriate. In 2018, we did 6-day Playshops in Hawaii, the US East Coast, Scotland and China. I will be doing the 3-day programs in the US and China until we certify trainers in the upcoming ‘Americas’ TTT training. But as the rumors of my retirement persist, a few Playshop graduates in different countries have decided that they could start their own facilitation training using VMC Playshop training material. I have written them personally to let them know that their action is inappropriate and that, “I am not dead yet!” Some of them have acknowledged their mistake and have complied with my request to stop and desist. As my protégés are back in their countries operating as VMC-Certified DCFacilitation trainers, I have composed letters to their communities that are appropriate for their cultures. In these letters, I state that that particular VMC-Certified Trainer is part of the VMC Global Training Team and is the only trained, certified and qualified person in that country to represent Village Music Circles. In preparation for Tomtom Yokota returning to Japan as a VMC-Certified Global DCFacilitation Trainer, I have written the following “Twigs and Leaves” letter to the Japanese recreational drumming and DCFacilitator community. It has also been posted on the Japan DCF Facebook and other Japanese recreational drumming social networks. “A Tree” is a Japanese cultural reference to a source and “Twigs and Leaves” is a Japanese reference to small disconnected parts of a source, or to outright Plagiarism. Hello, my name is Arthur Hull. Fifty years ago, I started developing and pioneering what is now known as the art of drum circle facilitation in the contemporary recreational drumming community. Thirty years ago, I started teaching other people how to facilitate drum circles. To date, I have taught 12,000 people in 34 countries, how to facilitate all kinds of rhythm-based events using the Village Music Circle techniques, exercises and nomenclature. I have now been teaching people how to facilitate drum circles in Japan for 14 years. In Japan, concerning drum circle facilitation, I am considered the tree. That’s why they call me the father of the modern facilitated drum circle movement. There have been a couple of people who, after taking only one or two of my classes, have decided that they can use the Village Music Circle, VMC, techniques, exercises to start teaching a drum circle facilitation class. These people have only a surface knowledge of my methods and have not been trained, authorized or certified by me to teach drum circle facilitation using my techniques, exercises or methods. These people are passing out and teaching what in Japan is called Twigs & Leaves from the Tree. In America, we would call it plagiarism. I have now developed a certification course that trains qualified people how to teach the 3-day Village Music Circles Playshop. I selected 16 qualified people from around the world, whom have been my proteges for many years. I have chosen and trained them to become VMC-Certified Drum Circle Facilitator Trainers. These people have been trained and authorized to teach the VMC 3-day Drum Circle Facilitation Playshops, and represent VMC in their countries. Other than the people listed below, no one else has been certified or authorized to use the VMC techniques, exercises and nomenclature to do drum circle trainings. This is a REMO supported project, and all of the VMC-Certified DCFacilitator Trainers are sponsored by REMO in endorsements and scholarships. Other than the people listed above, no one else has been certified by me or authorized to use the VMC techniques, exercises and nomenclature to do drum circle trainings. As part of our Village Music Circles Global Training Team, Tomoko Yokota (you know her as Tomtom) is the only VMC-Certified Drum Circle Facilitation trainer in Japan. She is a healthy branch of the original Tree. Tomtom attended her first Hawaii 6-day Playshop training in 2004. Since then, Tomtom has attended eight VMC Hawaii 6-day programs, and has organized or participated in over twenty 3-day Playshops. She has also completed a number of VMC Mentor leadership programs with Jim Boneau and myself. She is one of only a few fully VMC-Certified Drum Circle Facilitators in Japan. Tomtom is the first and only person in Japan who has been Certified to do VMC Drum Circle Trainings in Japan. Anyone else in Japan that is using the VMC techniques, exercises and nomenclature to do drum circle trainings are just passing out a few disconnected twigs and leaves from the tree. They may appear to understand the form, but they do not own the deeper content. I facilitated all kinds of drum circles, for 20 years before I started teaching other people how to do the same. If you know another person other than Tomtom, who is teaching drum facilitation trainings in Japan, ask them how many years have they been facilitating drum circles, and how many VMC trainings have they attended. As the Tree, I am writing to this community to acknowledge that Tomtom is a strong healthy branch of that tree. I stand beside her in recognition of her knowledge, wisdom, experience and expertise as the only VMC-Certified Drum Circle Trainer in Japan. I encourage this drum circle facilitation community to support Tomtom as she does the 3-day VMC Playshop trainings throughout Japan in the coming years. There are now hundreds of Village Music Circles 3-day and 6-day Playshop graduates facilitating drum circles in Japan. I encourage all of the Playshop graduates to attend the VMC Drum Circle Trainings that Tomtom is teaching as ‘Challenge’ participants. Challenge participants will be learning at the edge of your knowledge and experience. With Tomtom’s guidance, you will be learning new levels of drum circle facilitation techniques that are not available anywhere else in Japan. If I am the tree of drum circle facilitation, then Tomtom is a solidly connected branch of that tree. Do you want twigs and leaves misappropriated from someone else’s program, or do you want the real thing? Tomtom is the real thing. I will see you soon when this Japanese drum circle facilitation community is ready for another full 6-day Village Music Circles training. When that happens, Tomtom will be teaching by my side.